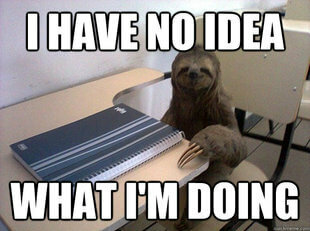 If you are embarking on your first AdWords campaign, choosing a starter budget can be daunting. If you outsource yoaur pay per click advertising, your initial budget will be among the first questions to come up. Businesses are often met with vague, unhelpful answers when they request advice on an initial budget. This is because it is hard for PPC experts to advise you when they know nothing of your financial situation or your goals. Meanwhile, it is challenging for a business to make a decision if they are unfamiliar with platforms like AdWords, its performance metrics and how the rest of their industry manages pay per click. For many companies, choosing a budget becomes an arbitrary, random act based on little data. After a bit of trial and error, businesses then find out what works best for them. However, selecting a starter budget for AdWords does not have to be rocket science and you can get helpful advice from PPC experts if you provide a little background insight into your business objectives. Firstly, you should have a clear idea of where pay per click advertising fits into your overall marketing strategy. Is it a small, supporting feature compared to other channels or an avenue where you hope to increase investment, perhaps to eventually usurp a more outdated marketing method e.g. print advertising? To aid with this decision it helps to have a little perspective into how the whole business world is investing in paid search. With an ever increasingly digital world, investment in all areas of digital marketing has been on the rise over the last few years. According to research collated by Econsultancy and NetBooster, paid search now accounts for around a quarter (24%) of the average business’ total marketing budget. The e-commerce industry is the biggest investor in paid search. On average e-commerce brands invest 29 – 57% of their marketing budgets in paid search. This shows that, for businesses already in the PPC game, it is a considerable investment, however this does not mean you should commit a quarter of your whole marketing budget to pay per click advertising straight away. 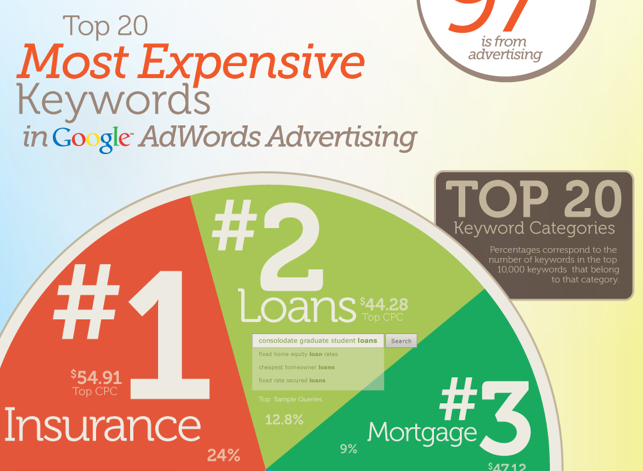 There are a large number of factors that should be taken into consideration when choosing an initial AdWords budget. 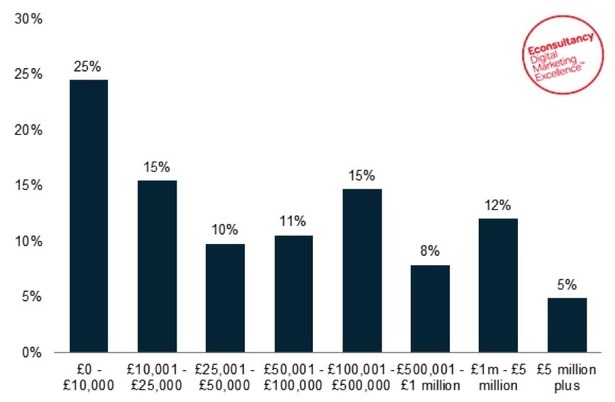 While Econsultancy and Netbooster found that PPC was a major part of most business’ marketing budgets, this varied significantly by annual income. Interestingly, companies with the highest incomes dedicated smaller proportions of their marketing budget to platforms like AdWords than lower earners. What is the lifetime value of each customer you gain? Are you committed to making PPC advertising a staple of your overall marketing strategy or is this just a small test? How many new customers/clicks/impressions do you hope to acquire and in what time frame? All these elements will have a big impact on what your business is willing to invest in an initial budget and this is why budget guides can be highly subjective. As you can see pay per click advertising with AdWords could fit into your business plan in a number of ways. Your campaign objectives are the most important element in planning a starter budget. Advertisers should have a clear idea of their company goals and what role PPC will play in achieving those goals. To plan a healthy starter budget, it helps if you understand your objectives in the context of AdWords. If you wish to increase customer or lead numbers by a target amount, within a time period e.g. a month and make a profit on your campaign investment, then ROI and CPA or CPL would be your key metrics to watch. Your strategy and budget would aim to ensure a decent ROI, while achieving your goal number of customers. If your company is looking to push hard on an expansion, then your core objective will be purely focused on customer or lead generation regardless of CPA. Conversion rate will be your main concern. If you are hoping to increase knowledge of your brand then impressions will be a central metric and if you are looking to primarily drive traffic to your content, then click rate and CPC will be the core metrics to focus on. Once you understand your campaign objectives and strategy focus, it is time to calculate your initial budget. Achieving a good return on investment, while generating more customers, is one of the most popular campaign objectives. In the majority of cases businesses are looking to make a profit and pay per click advertising is an excellent way to attract new customers quickly. In the example below we will be focusing on an ROI and conversion focused campaign. Remember this is only a guide and when planning your own budget, you should take into account any additional factors that could influence the budget as listed above. If you wish to generate new customers, you should first have a goal amount in mind e.g. 360 new customers per month. To roughly calculate a suitable starter budget for this goal, you first need to know how much traffic would be needed to produce this amount of conversions. If you have ever run an AdWords campaign before this will be straight forward, as conversion number, conversion rate and CPA can be easily reviewed. However, since this is an initial budget plan, let’s assume the business has never had an AdWords campaign before. You can still get an idea of your organic conversion rate from Google Analytics, assuming you have the right goals set up. Head to your Google Analytics dashboard and view acquisition. Viewing acquisition by channels and referrals is useful for analyzing how well Google organic search works for your business. Be aware that this will only serve as an initial guide and traffic from PPC may behave differently than organic traffic. Here you can review your organic conversion rate. Ensure you view a wide enough range of time to get the most accurate estimate possible and that you are looking at the correct goals (these should be the equivalent goals you will monitor in the AdWords campaign). Now that you have an idea of your current conversion rate, you can use it as a base guide to calculating a starter budget. The following formulas from Portent provide an easy way to plan a starter budget if you want to focus on conversions and positive ROI. We hope you are ready to enjoy some maths. Traffic required = customers needed / conversion rate. Imagine your conversion rate was 3%, you would divide 360 by 3%. So, you would require approximately 12000 visitors to generate the required conversions. Now you know how much traffic you need, it is time to work out your approximate average CPC for the campaign. Be aware that CPC is subject to your quality score and bids and those of your competitors, so it can fluctuate. If your required traffic for the desired number of customers was 12000 visitors and your CPC was $2, your total budget for the month (or your specified time period) would be $24000. Making your daily budget in AdWords $800. When carrying out these formulas it can be helpful to do two calculations for your high end and lower end potential conversions rates e.g. if your conversion rate was 3% try the calculations with a lower range of 2.5% and a higher range of 3.5%. Use the formula: expected gross revenue = AOV x new customers. If your average order value is $400 and the desired customer goal for the month was 360 your expected revenue would be $144000. Return on investment is: ROI = (gross revenue – investment)/investment. You predicted ROI would therefore be 5%. Keep this target in mind during strategy tweaks in your campaign once it is live. If you don’t enjoy maths, once you have your base values from Google Analytics and the forecast tool, use this calculator to fill in the blanks. Head over to the Paid Traffic mini AdWords budget guide for an additional budget plan example using a lead focused objective. It is therefore not at all stressful or complex to calculate a suitable starter budget, as long as you don’t fear formulas. Now you have your budget and projected ROI you can breathe a sigh of relief. What is a good conversion rate and ROI? The formulas and strategy above will help businesses and PPC experts work together to create a suitable starter budget for an AdWords campaign. Those who are new to pay per click advertising will also need to understand the value of their campaign. It is hard to craft an appropriate strategy if businesses cannot understand their results. What results should I expect from my budget and what is a good ROI are frequent questions from new advertisers. ROI and conversion rates can seem mysterious because a good conversion rate and ROI will depend on your industry and objectives. While it is a subjective matter, we can help to demystify ROI and conversion rates by looking at some global PPC averages. Track Maven offer a brief overview by listing 2.45% as the average conversion rate on AdWords. The top 25% of advertisers achieve a rate of 5.31% and the elite top 10% of advertisers achieve an average of 11.45%. Achieving a conversion rate of 2.45% would be an excellent start. AllBusiness.com explain the quality of conversion rates as less than 1% as a poor conversion rate. 1 – 3% is labelled as an average conversion rate, 3 – 10% is a high conversion rate and the top advertisers achieve over 10%. Advertisers should remember that, while these measurements will be accurate for many businesses, for some industries it will not be relevant. Consider luxury holiday homes as an example. It may take a lot more visitors to complete a conversion but still be hugely profitable if only 1/100 buy. Property and other high price items take more research and the conversion funnel will be longer. This is great for understanding a good conversion rate but what ROI should advertisers expect to gauge a successful campaign? The easiest way to judge positive ROI is as a ratio. A 5:1 ratio would be a positive ROI because for every $1 you invest you would make $5 gross revenue, which is $4 ROI. This is dependent on your cost of goods sold. If your COGS are less than 50% of your sales price, you could still have a good ROI at a lower ratio. Now you can calculate an initial AdWords budget, you have a good idea of what a positive ROI and conversion rate look like and you know what variables to consider when building your budget. Before you launch your new campaign and budget it is useful to know how to apply your budget effectively. Many new advertisers make a critical error at this juncture. Top of funnel terms are typically more expensive, more competitive and have the most search volume. 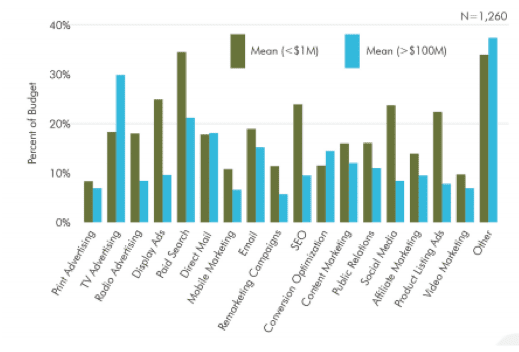 Desiring greatest reach, advertisers dedicate the largest portion of their budget to top funnel keyword campaigns. Top funnel terms like ‘SEO software’ have less intent than bottom of funnel terms like ‘buy Ahrefs SEO software’. The former searcher is likely to be in research mode, whereas the latter is closer to buying. To conserve your budget and maximise conversion quality, put the largest portion of your budget behind high intent, bottom of funnel terms. This is particularly important for advertisers in the most competitive industries. In the early stages of your campaign, if you place your budget behind high intent terms, you can save money while gathering data. Then you should move the majority of the budget behind your top performers for greatest effect. What about entry level budgets for small businesses? The techniques outlined in this guide will help a company of any size plan a realistic starting budget for AdWords. Yet, some small business, new to pay per click advertising, may be intimidated by how much they should invest in AdWords. When small businesses are confronted with the amounts larger companies in their industry invest in AdWords, this can leave them disheartened. They can be concerned their industry is too competitive and incorrectly conclude pay per click advertising and AdWords are not a suitable strategy for their business. This is a very common misconception and the concerns are not entirely without merit. Small businesses can waste a lot of money on AdWords but not for the reasons you might expect. A report from Search Engine Land found that a large number of small businesses were wasting 25% of their budgets. That is extremely troubling for SMBs but the reasons were rarely related to budget size or the competitive nature of their industry. The report reveals that SMBs faced ongoing problems with poor quality enquiries, which wasted the majority of the budget. Investigation of this dilemma usually reveals the culprit is poor campaign management, rather than the small budget being at fault. Most SMBs are spending budgets just over $1k a month. This is more than enough to achieve some pleasing results, even in fairly competitive industries. The biggest issue small businesses face is lack of time to adequately manage the campaign. The more challenging the task the more monitoring and testing is required. Smaller budgets actually require more effort. Tests and experiments take longer due to the lower budget, so PPC managers have to watch campaigns very carefully and take a long-term approach to the success of the campaign. Budgets for pay per click advertising should not be static. It is unlikely your first budget will remain the same, as the most successful PPC campaigns evolve their strategies to follow the data. You may increase your budget to push new products or expand and decrease your budget when your strategy is refined for best CPA / CPL. A starter budget enables a business to kick off a campaign with enough funds to start gathering valuable data and see which tactics work best. For businesses looking to focus on high conversion rates, low CPA and positive ROI consider incorporating the display network (typically lower CPCs), remarketing and similar audiences (higher conversion rates). Always consider the nature of your product or service and how much time it takes a user to convert. Remember users love to research before they buy, so targeting users who have already begun their research is a big bonus.